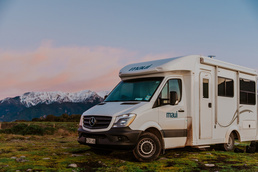 New Zealanders refer to motorhomes as campervans, and there are plenty of options for renters, from small and simple sleepervans to 6-berth campervans with the bells and whistles. 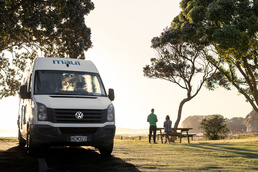 Big vehicles mean more space and a touch more luxury, whilst smaller vehicles get you closer to nature and the locals in this beautiful and friendly country. 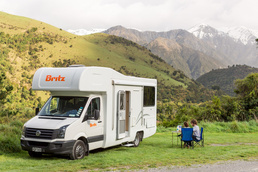 2 berth vehicles are more likely to be called campervans, and are common in the southern hemisphere and amongst the more adventurous road trippers. 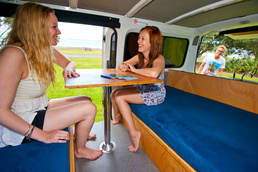 Essentially just converted vans, these have very limited facilities, often only a bed and a simple gas stove. 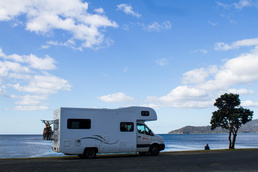 They are great for those on a budget, and intrepid travellers who want to get to meet new friends by using the shared facilities at campgrounds. 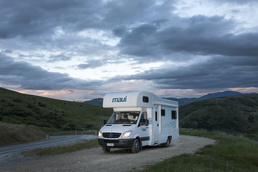 These are a step up from the 2 berth sleepervan and are often luxurious. Still built on a van base, they contain sleeping space for two, kitchen facilities and a shower and toilet for improved ablution abilities. The self-contained nature of these allows for free camping where it is legal. 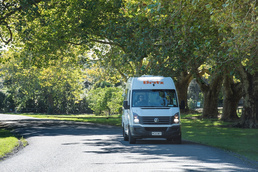 2 Berth STs can be found in petrol or diesel configurations, and with automatic or manual gearboxes. Their small size makes them easy to manoeuvre and allows them to navigate. A 3-berth motorhome is usually a campervan-style vehicle, so is lightweight and easy to handle. They are great for a family of 2 adults and one child, with one double bed and one single bed. Cooking, bathroom and other facilities range from vehicle to vehicle- some will have shower and toilet facilities, some won’t- so check this before hiring. 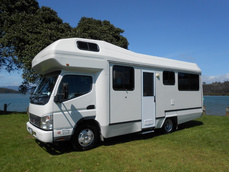 These larger motorhomes are generally built on a truck chassis. 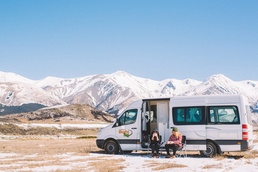 They have much roomier living quarters than the van-based campervans, and often are configured with a double bed above the cab and a dining area which converts into another. 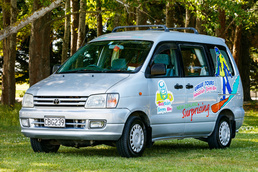 Equipped with kitchen and bathroom facilities, these are great for families of up to 4, especially with small children. 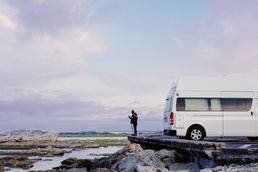 These are the vehicles for those really adventurous road trippers! With various interior layouts, these are usually made to sleep and seat two or three people. 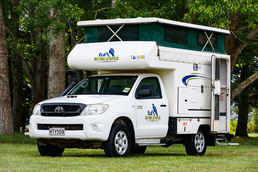 Some rental companies will advertise 4WD campers which are standard vehicles seating five passengers that come equipped with tents for sleeping. 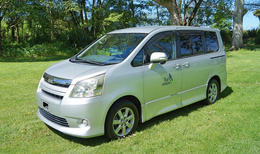 They are built for off-road explorations and are the only rental vehicles allowed on unmarked roads and tracks. These are built on a truck chassis and can reach up to 7.2 metres in length. They can have a wide range of layouts but generally have three double beds, of which one is smaller and suited to two children or one adult. 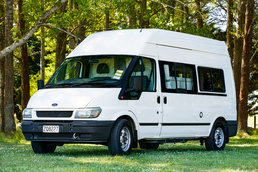 These large vehicles are a great for families, groups of friends or even a couple who prefer a bit of space to move around. Diesel or petrol, manual or automatic, these can have a range of different features. 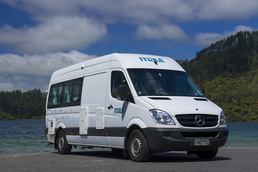 They are equipped with kitchen and bathroom facilities, and often have such luxuries as televisions, full air conditioning and heating, freezers and DVD players. 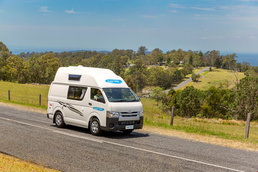 For those with big families or a couple who wants plenty of space, a 7-berth motorhome is the way to go! They are RV-style vehicles usually built on a long wheel base. 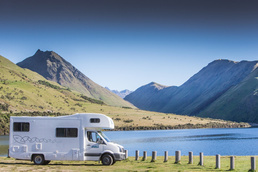 These are generally full of home comforts including cooking facilities, hot and cold water, shower, toilet and more. 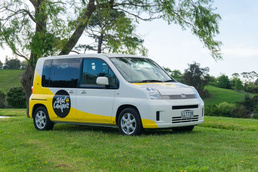 Excellent for a large family, and they are self-contained so allow you to drop off the grid for a day or two.